Should a Red Maple be Planted There? 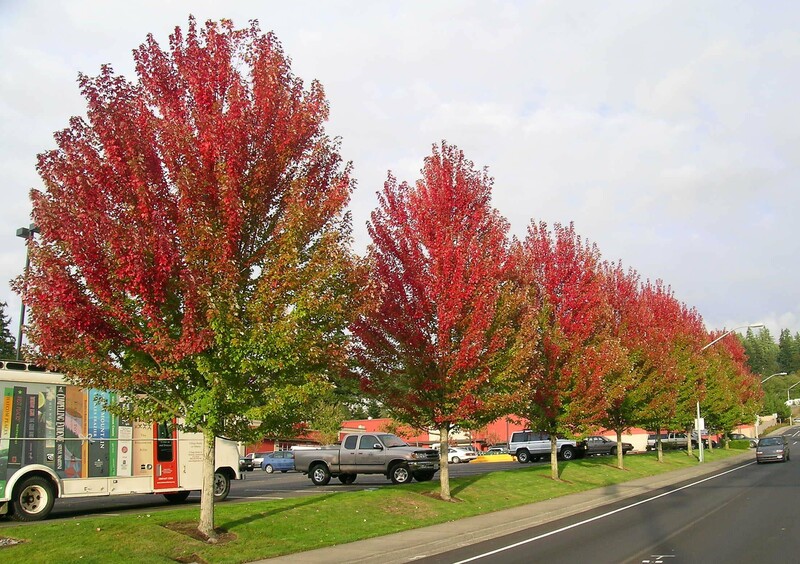 Red Maples are among the most frequently planted urban trees. Many of its features, especially its leaves are quite variable in form. Its flowers, petioles, twigs and seeds are all red to varying degrees. But, it is best known for its brilliant deep scarlet foliage in autumn. Red Maple is adaptable to a wide range of site conditions, perhaps more so than any other tree in eastern North America. It can be found growing in swamps, on poor dry soils, and most anywhere in between. However, the tree health and appearance decreases when trees have more impervious surfaces around them. 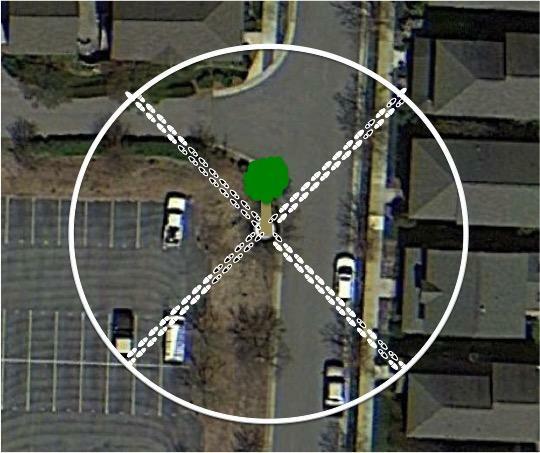 North Carolina State University research has developed the impervious surface threshold (http://content.ces.ncsu.edu/impervious-surface-threshold-for-sustainable-urban-tree-planting-and-landscaping-design) which can be used to identify planting sites where Red Maple will thrive. Landscape architects, urban planners, arborists, landscapers, and other professionals can use these impervious surface thresholds to reduce Red Maple management and replacement costs. Trees surrounded by less than 33% impervious surface cover will most likely be in good or excellent condition. Trees surrounded by 33%-66% are likely to be in fair condition. Trees surrounded by 67% or more tend to be in poor condition. Impervious surface cover can be measured by using the “Pace to Plant” technique. 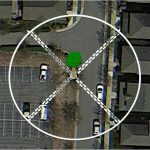 The “Pace to Plant” technique is a tool to quickly and accurately quantify the amount of impervious surface surrounding a tree or planting site. Begin by standing at the planting site and identify the closest impervious surface edge. Take 25 steps at 45⁰ to the nearest impervious edge, counting only the steps that land on the impervious surface. Then, return to the identified planting site and begin walking 25 steps in the opposite direction. Again, only count the steps that fall onto impervious surface. If you encounter a building or wall, count the remainder of the steps as impervious. One more time, return to the starting planting site. This time turn 90° and begin walking 25 steps and count the steps that fall onto impervious surface. Finally, turn around and go back to the planting site and begin walking in the opposite direction for 25 steps. This will be the fourth time that steps falling onto the impervious surface are counted. Having walked in four directions located 90° from each other, completing an “X” through the planting site, the transect is final with a total of 100 steps have been taken. By totaling the number of steps that fall onto impervious surfaces the percentage of the surrounding ground area can be determined. For example, if the total number of steps falling on impervious surface is 65 (out of the potentially 100 steps), the percentage of impervious surface is 65%. Using the established criteria, the site would not be suitable for planting a Red Maple. 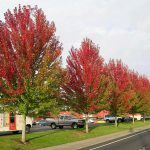 While North Carolina State has only researched the Red Maple tree species, the “Pace to Plant” technique could be used to determine suitable sites for many different trees being considered for commercial urban planting. By evaluating the impervious surface restrictions, better tree species selection may be possible. If the right tree for the right place is chosen well, stress to urban trees, including pest infestations, can be reduced.